Savory, rich soup full of earthy flavors. Cut pumpkin in half, remove seeds and place cut side down on a baking sheet, lightly greased. 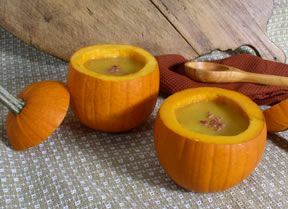 When cool, scoop pumpkin out of shell and set aside in a bowl. In a soup pot or medium saucepan, heat two tablespoons olive oil. Skip the above steps if using canned pumpkin purÃ©e. Add cinnamon, allspice, nutmeg and ginger, stirring constantly for one minute. Add the chicken stock, apple cider and reserved pumpkin (or pumpkin purÃ©e) to the pan. Reduce to a simmer and cook 15-20 minutes, stirring occasionally, until the vegetables are tender. 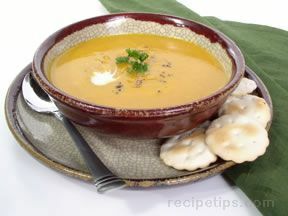 Remove soup from heat and process with an immersion blender or put in a blender and blend until smooth. Add the cream to the soup and stir to combine. Note: Fill blender no more than 1/2 full with soup. 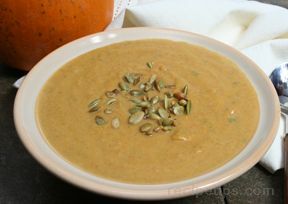 Allow soup to cool and least 5 minutes before blending. Leave one corner of lid open on blender to vent so that soup doesn't explode out.